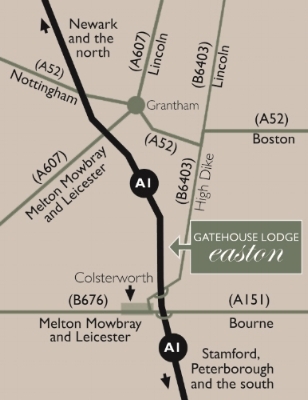 Ideally situated just off the A1, the Easton Estate is just 100 miles North of London, between Stamford and Grantham on the Lincolnshire/Rutland border. Grantham is about 65 minutes by high speed train from London King’s Cross, and a short taxi-ride will bring you to Easton and Burton-le-Coggles in under an hour and a half from London. On the A1 go under two bridges at Colsterworth. Just after the 2nd bridge take the left turn to Easton/Ancaster and go up over the bridge. Turn right onto the B6403 and continue north for c. 1 mile. Turn left onto a pretty no-through lane into the little village of Easton, and follow the signs to the Easton Walled Gardens Car Park, which is on the left hand side. Go on past the Car Park and turn left at the large memorial Cross. You will find marked car parking to the left, just before the stone pillar and a short path will take you to the Lofts. You will find the Gatehouse Lodge in front of you to the left of the arch. Please feel free to park in the Forecourt in order to unpack, but we would be grateful if you could then leave your car in the named space provided. Many thanks. 5 miles south of Grantham you pass through Great Ponton on the A1. Continue for about 3 miles passing Easton Park and Easton Walled Gardens on your left. Turn left off the A1, signposted B6403 to Easton. After about 1 mile, turn left onto a pretty no-through lane into the little village of Easton, Go down into the village and follow the signs to the Car Park, which is on the left hand side. Go on past the Car Park and turn left at the large memorial Cross. You will find marked car parking to the left, just before the stone pillar and a short path will take you to the Lofts. You will find the Gatehouse Lodge in front of you to the left of the arch. 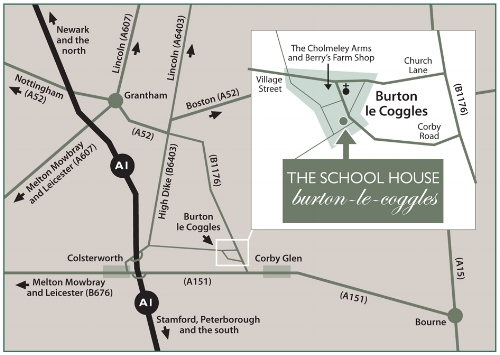 Take the 1st Left (after c. 4 miles) onto B1176 to Grantham, Bitchfield, Burton-le-Coggles. Take 1st Left (after c. 1 mile) into Burton-le-Coggles. The School House is on the left hand side, on the corner of Manor Road and Post Office Lane, and just before the red telephone box. Parking is on Manor Road, just outside the cottage. There is extra parking available. The Postcode for the School House is NG33 4JR, but this is shared with much of the village.